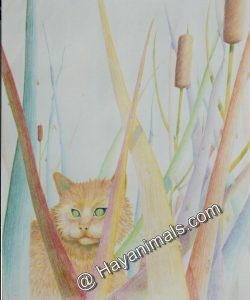 MEDIUM: Coloured Pencil FOR SALE Hidden amongst bull rushes the cat is spying on the world – in my Realistic Fantasy group. 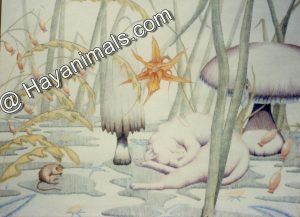 I just love bull rushes! 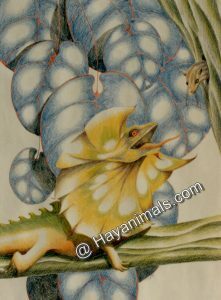 MEDIUM: Coloured Pencil FOR SALE Years ago I did quite a few drawings of a fantastical nature – this one is what I used to categories as Realistic Fantasy. The leaves I had loved when on a trip to the Caribbean – althought they were green with scarlet veins as opposed to being blue based. 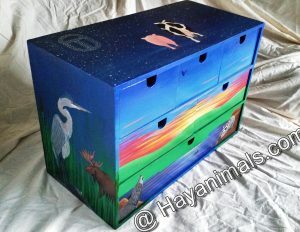 MEDIUM: Acrylic PRIVATE COLLECTION This was a birthday gift for my brother – containing some of his favourite animals from up at his cottage in Muskoka and other things he liked. 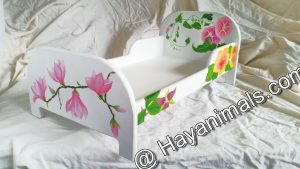 I loved priming and painting it for him.